Published: Nov. 22, 2016 at 02:07 a.m. Updated: Nov. 22, 2016 at 01:32 p.m.
For only the second time in history, an NFL game was played in Mexico. The Oakland Raiders defeated the Houston Texans 27-20 and fans enjoyed a week's celebration of American football. 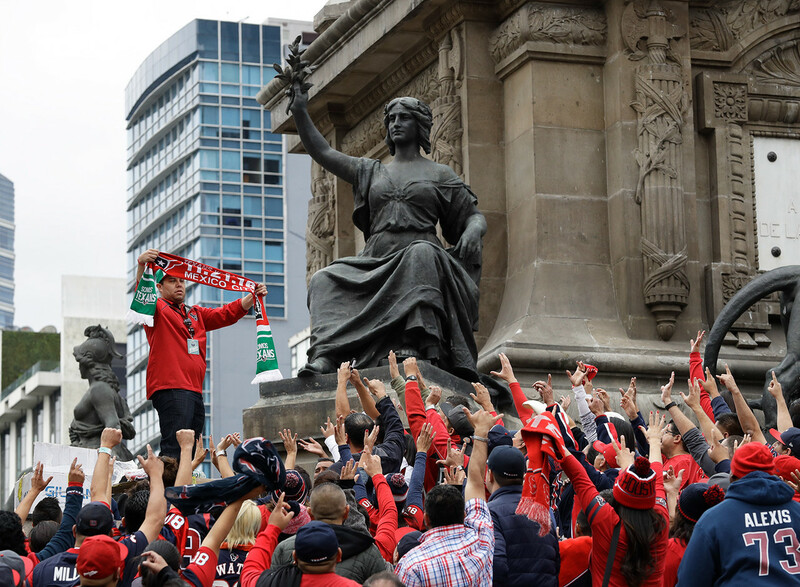 Houston Texans fans hang out at the Angel of Independence monument. Pedestrians walk and stop by the collection of helmet sculptures lining the sidewalk of Paseo de la Reforma on in Mexico City created by local artists. Houston Texans cheerleaders and mascot lead a yoga class at the Angel of Independence monument in Mexico City. Wall with different signatures of special guests during a dinner with Visit Mexico at Monumento a la Revolucion in Mexico City. NFL fans look a Super Bowl rings during NFL Fan Fest in Chapultepec Park. A general view of outside Azteca Stadium hours prior to kickoff. A dressed up Oakland Raiders fan poses for photos as she arrives at Azteca Stadium. A fan waves the Mexican flag with the Houston Texans logo on it. Houston Texans wide receiver DeAndre Hopkins's cleats with the Mexican Flag on them sit in his locker. A general view of Estadio Azteca Stadium during the singing of the Mexican National Anthem. Oakland Raiders cheerleaders perform during the halftime. Houston Texans nose tackle Vince Wilfork (75) leads the team in the pregame huddle. Oakland Raiders wide receiver Michael Crabtree (15) reaches for a pass during an NFL football game against the Houston Texans in Mexico City. Houston Texans running back Lamar Miller (26) runs the ball against the Oakland Raiders in Mexico City. Oakland Raiders running back Latavius Murray (28) runs the ball against the Houston Texans as quarterback Derek Carr (4) celebrates. Oakland Raiders quarterback Derek Carr (4) and wide receiver Amari Cooper (89) celebrate after Cooper's game winning touchdown late in the fourth quarter. Oakland Raiders defensive end Khalil Mack (52) and quarterback Derek Carr (4) run off the field with large smiles after defeating the Houston Texans.